Metallic Pigments Market size was over USD 1.5 billion in 2017 and industry expects consumption above 185 kilo tons by 2024. Rising number of infrastructure projects and booming automotive sector has majorly impacted the paints & coatings industry which may accelerate metallic pigments market growth. Rising industrialization, changing lifestyle patterns and population growth may contribute to rapid construction activities in emerging countries such as China, India, Vietnam, Bangladesh and Indonesia. These products improve the aesthetic appeal substrates thereby providing glossy finish along with increasing opacity, corrosion resistance and ductility. The construction industry in Southeast Asia was valued at over USD 250 billion in 2018 which indicates tremendous market growth potential. Rising demand for packaging applications primarily in food & beverages, gift wraps and tobacco industry may stimulate metallic pigments market demand. The availability of advanced color shades, enhanced appearance of packaged items and increased product differentiation may have a positive impact on the suitability of metallic pigments for packaging applications. Global printing inks market size may exceed USD 20 billion by 2024 which is expected to provide ample opportunities in the market. These products are witnessing high demand from the printing ink industry owing to their suitability with wide range of surfaces such as plastic, paper & cardboard and gloss improvement. 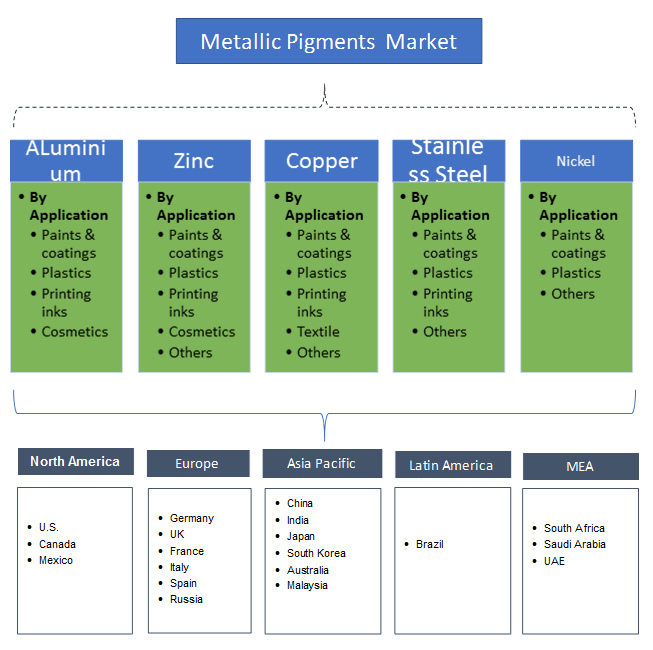 Rising demand for aluminum products from the coloring additive and automotive industry may boost metallic pigments market growth. Aluminum pigments impart a silvery, metallic appearance, thereby improving the sheen and radiant effects of substrates which increases their suitability for such applications. Raw material price instability and surging costs of precious metals may hamper metallic pigments market growth. Also, stringent government regulations related to volatile organic compounds & particulate matter emissions and may act as a growth restraint. For instance, EU REACH regulations related to chemical production and their health & environmental impacts, and China’s VoC regulations which deal with operations in the printing, paints & coating, packaging and chemical industries may have a negative impact on the market growth. Aluminum based metallic pigments market size was valued at over USD 650 million in 2017. Rising demand of powder coatings pertaining to their low environmental impact may contribute to aluminum pigment market growth. These products are available in a wide range of shades and exhibit high light reflectivity, thereby enhancing visual appeal along with enhancing rust and corrosion resistance. 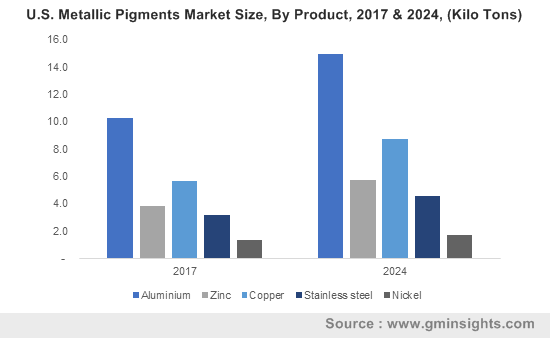 Zinc based metallic pigments market size from paints & coatings applications is likely to witness gains at over 6% by 2024. High product demand for marine & protective paints, flakes used in the automotive industry and mechanical plating of nuts & bolts is likely to stimulate market growth. These products reduce permeability to corrosive substances owing to their lamellar structure thus enhancing anti-corrosive properties. Copper based metallic pigments market from plastic applications is expected to witness USD 100 million by 2024. These products provide a metallic leafing finish, exhibit non-toxicity, durability and long-lasting effect. These pigments witness high demand from automotive coating, resins, nail polish and paints industries which is predicted to boost market size. North America led by Canada and the U.S. metallic pigments market size may exceed USD 600 million by 2024 and is expected to witness significant gains in the forecast period. Economic recovery from the effects of the Great Recession has resulted in increasing middle class population which may boost market growth. Moreover, rising innovation by manufacturers to promote sustainable raw material usage may further boost industry growth. Asia Pacific led by India Japan, and China metallic pigments market size may register gains of 6.5% by 2024. Booming product demand from paints & coatings, plastics and printing and packaging industries may contribute to industry growth. Moreover, the region is witnessing rising passenger & commercial vehicle sales and residential construction projects owing to technological advancements, shifting consumer preferences and economic growth which may further stimulate regional market demand. Europe metallic pigments market demand, driven by Germany, UK, France, and Italy may witness significant gains at over 6% in the forecast timeframe. These products impart color, metallic reflection and coverage to cosmetic colorants along with creating polychromatic effects. Increasing demand from several cosmetic products such as powders, nail varnish, eyeshadows, shower gels and haircare products is predicted to further promote regional product demand. Global metallic pigments market share is moderately fragmented and competitive with key industry participants BASF SE, Clariant, Toyo Aluminum K.K., Sun Chemical Corporation, Silberline Manufacturing, Carl Schlenk AG and Altana. Manufacturing companies are focusing on innovative strategies to facilitate product development that meet the sustainability and quality requirements of environmental regulations. Moreover, they are focusing on technological advancements which enables cost effectiveness and increases product value thereby boosting overall market growth. Metallic pigments are primarily inorganic substances composed of metals or metal alloys which impart color to a material. These products include both organic and inorganic pigments which include one or more metal atoms in their molecules. These products impart an attractive look, enable creative product presentation, prevent corrosion and increase product life which may contribute to rising demand. These products are utilized in automotive, infrastructure, packaging, printing inks, paints & coatings and cosmetics industries. Increasing demand owing to changing consumer lifestyles and rising competition among manufacturers which has increased the focus on product differentiation may accelerate metallic pigments market size.